Story and photos by Elise Cardenas At the end of a strip mall in North Austin a line of people curve around the corner patiently waiting to enter Ramen Tatsu-Ya. I take my spot at the end of the line. After nearly 30 minutes of listening to unknown fragments of an Asian language, intermixed with the recollections of ACL festival attendees, I enter the ramen shop. 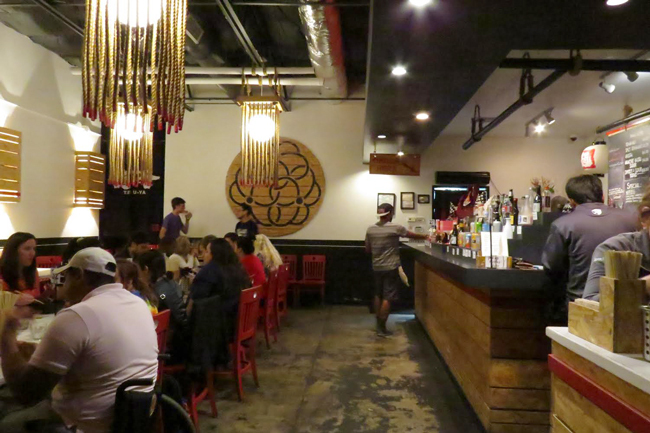 A Japanese ramen shop established just two years ago in North Austin, Ramen Tatsu-Ya only seats 38 people, which explains the 30-minute wait for Friday night dinner service. If you consider ordering food to-go to cleverly skip the line, think again. The restaurant does not take to-go orders, which adds value to the limited number of red chairs inside. Despite its size, the dining room invites customers beyond the doors. Along with the typical tabletops, a long communal table spans across the center of the restaurant welcoming customers into a family setting. 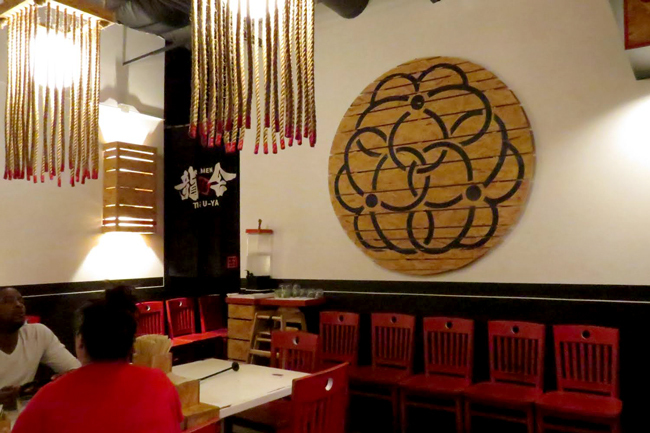 “I think the communal table brings diners together in a fun way, like having a big family meal,” says Tatsu Aikawa, executive chef and owner of Ramen Tatsu-Ya. The use of wood dominates the restaurant’s design along with bursts of red, white and black. “We took a little riff on Kabuki colors and wanted a natural wood to go with it,” Aikawa says. In Japan, Kabuki Theater features actors wearing makeup that symbolically represents their character. Common colors, among others, include red and black designs painted on all white faces. After admiring the décor from the communal table, waiting for my order seemed to pass quickly , compared to the wait to enter the restaurant. 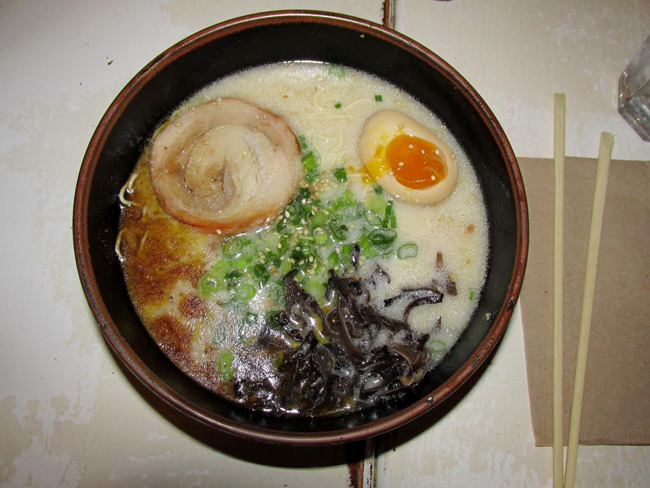 My order, the Tonkotsu Original, arrives within minutes in a large, steaming black bowl. Each ingredient showcases itself upon first glance. The divided sections within the bowl house ingredients like chashu — a soft, braised pork belly that the chef wraps into a roll by hand and marinates over the course of a few days — ajitama, a seasoned soft-boiled egg, wood ear mushrooms and scallions. These ingredients atop thin ramen noodles floating in a thick, buttery broth. 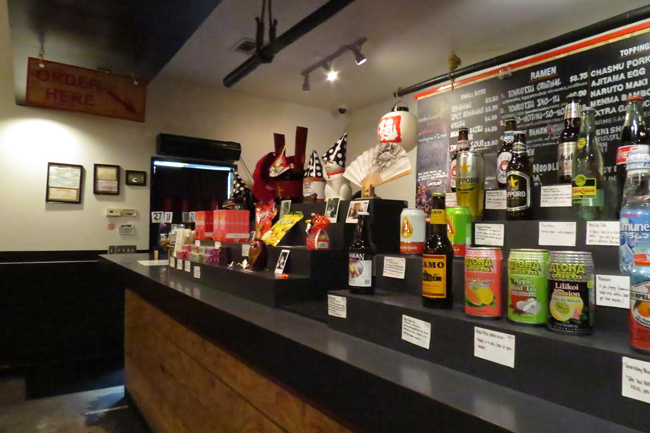 The owners plan to expand to a new location on South Lamar by next year to continue serving Austin’s ramen enthusiasts.